An SNP MP has said continued austerity will fuel demand for another independence referendum and has resurrected Alex Salmond’s “dark star” of London rhetoric. Glasgow South West MP Chris Stephens also drew parallels with Glasgow and US city Baltimore as portrayed in TV drama The Wire following decades of Labour council administration in an essay for a new publication by Scottish Left Review Press (SLRP). Mr Stephens said: “The fundamental problem with delivering a socialist agenda across and within the nations lies in the geographical concentration of wealth and power in Britain. He said the most logical way to enable wealth distribution is “at the most local level possible” with a powerful government close the communities it serves. “Staying within the existing Westminster-led system of government makes no sense in that context and further austerity imposed by an unelected (in Scotland) government will only fuel demands for second referendum,” he said. Mr Stephens, a former Glasgow Council employee and union activist, also attacked the council for “worshipping at the feet of the global tourism and conference industry”. “The council has always resorted to cutting community services and budgets when seeking savings but at the same time embracing the conventional to the point of banal waterfront regeneration agenda,” he said. “Not for nothing can I see the parallels between Baltimore and Glasgow when I watch The Wire. 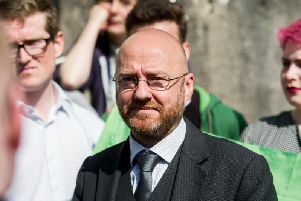 Mr Stephens’ rhetoric echoes Alex Salmond’s referendum campaign criticism of London as “the dark star of the economy, inexorably sucking in resources, people and energy”. In his essay for the SLRP, Mr Findlay accused the SNP of mimicking “Blair-era Labour” with its “message, discipline, stage-managed conferences and use of social democratic language while cosying up to big business”. “The supposed political truth that the SNP is a progressive, radical force threatening the establishment is (an) assumption in need of dismantling,” he said. He said the SNP is now interlocked with “the old establishment in Edinburgh”, pointing to the appointment of Sir Angus Grossart, the merchant Banker and head of Charlotte Street Partners, as chair of the Scottish Futures Trust (SFT). Mr Findlay also attacked the radical left groups that have embraced nationalism. He said the SNP faces a problem of “slowing down the march to independence” with its grassroots keen for a quick re-run but polls suggesting “Scottish people actually have no stomach for another referendum despite the nationalist ascendancy”. “If independence is shunted down the priority list, it must lead to a greater attention to the SNP’s day-to-day work and by extension its day-to-day failings,” he said.